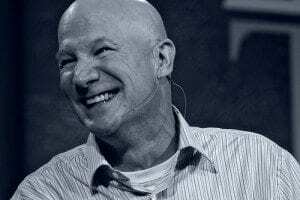 CJ Mahaney has withdrawn from the 2018 T4G conference. This due in large part from the spotlight Rachael Denhollander has shined on Sovereign Grace Churches (SGC, formerly Sovereign Grace Ministries (SGM)). Additional heat was applied by The Washington Post and Fox television, among others. When the flame got sufficiently hot CJ’s stalwart supporters, Mark, Lig, and Al (as CJ refers to them – known to the rest of us as Mark Dever, Ligon Duncan, and Albert Mohler) undoubtedly pressured the unrepentant Mahaney to once again sit this conference out, just as he did in 2014. I suspect the T4G celebrities are confident that, just as in 2014, the spotlight will soon be off Mahaney and SGC and CJ will once again be able to reunite with his gospelly buddies and return to the Christian celebrity stage. Left unsaid is whether Mahaney will still receive his cut of the proceeds from the sold-out T4G conference. My guess is he will. While it would be interesting to know just how much the celebrities will be pocketing from the T4G extravaganza, don’t hold your breath waiting for financial transparency from your elite superiors. “Mahaney is a con artist. He categorically insists, “I am innocent of the allegations that have been made against me personally” but refuses to defend his innocence. He just pronounces himself sinless as though he were God issuing a divine fiat. …I could go on and on. C.J. Mahaney is a serial liar. That is not slander. That is not an exaggeration. That is not malicious. It is the simple truth. And it has been fairly and justly proven time after time. It is an absolute disgrace that Mahaney is supported by ten of the most powerful leaders in evangelicalism. They have brought great shame to the gospel of Jesus Christ. If they were really together for the gospel, they would have removed C.J. 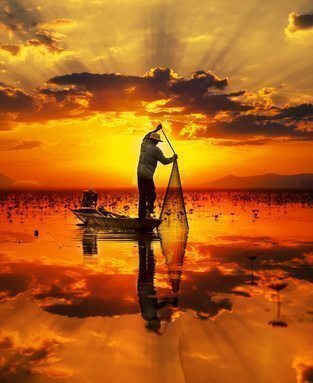 from ministry long ago and then sought to restore him in God’s timing. Instead they have steadfastly transgressed the teaching of Scripture in proclaiming a man “above reproach” when he is clearly a man of great reproach. Source: Mahaney’s Withdrawal from Together for the Gospel Is Meaningless as He Continues to Run from an Independent Investigation with the Help of Al Mohler, Ligon Duncan, Mark Dever, et al. 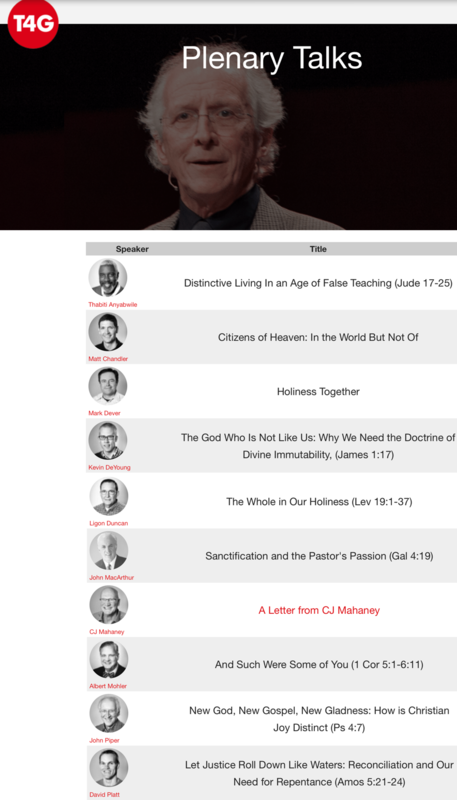 While I am thrilled CJ Mahaney will not be speaking at the T4G conference, there are several things which highlight the fact that CJ Mahaney, as well as every single one of the “Christian” celebrities speaking at the conference, simply do not “get it.” First, as stated above, Mahaney continues to proclaim the total innocence of himself and his denomination. Second, all of the celebrities have expressed their strong support for CJ Mahaney. 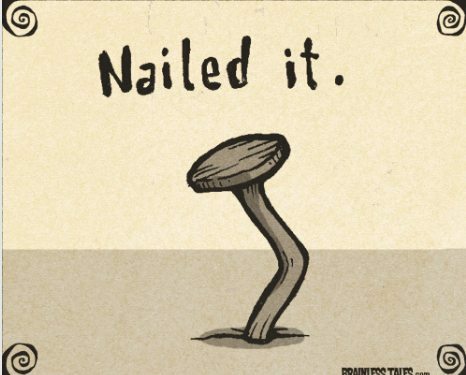 Some by signing statements endorsing Mahaney, others by speaking at Mahaney’s church, and all of them by willingly sharing the conference stage with the con artist. To my knowledge, not one of these men has backed down from their support of Mahaney. Further, the problem is not just CJ Mahaney. Sovereign Grace Churches has many leaders that have participated in covering up sexual abuse. Topping the list is Executive Director of SGC, Mark Prater. Bob Kauflin is a close second. Both men will be actively participating in the T4G conference, as will Jeff Purswell. Why? It only makes sense that if Mahaney had to withdraw his buddies should also have to go. “I was once best friends with the present leader of SGC. In fact, I was the person who led him to CFC several years ago. The leader’s wife at the time was very hesitant in attending the church because she suspected that it may be a cult. (Good discernment) I work ed very closely with the leader at a large Pharma company and was his boss at the beginning of our friendship. he followed me to our home office and actually betrayed me twice to get ahead at the company and to become a leader in SGM. I forgave him and eventually went with him to Pittsburgh to plant His church in the rich suburbs. His vision before his elevation was to minister to the poor, addicted, homeless, etc. Opps, not many of those in Upper St. Clair.We eventually left the church because it was not a good place for non home schooled children to attend and the mystery surrounding LT’s departure. He “loved” the church plant until the upward call came from CLC to be one of their pastors in Chads Ford, PA.(Another area steeped in poverty. NOT!) They made room for him by degifting one of their own. His rise to the top of SGC is history. MP was trained to deal with crisis management and negotiation by the best in the business. That coupled by his humble, caring and nice demeanor certainly makes him well qualified to be the Mahaney and SGC front man. MP makes a great #2 man who can be manipulated by others in his ambitious pursuit of upward mobility. I personally am appalled by what I have heard and read about concerning his protectionist tactics over the years. I have tried to reach out to him by calling his office (his admin daughter would not let me through, emails and via his twitter account. No response. That Mark Prater leads a denomination like SGC is not surprising. What I find disconcerting is that a guy like Mark Prater has been extended an invitation to speak at T4G! With major conference roles given to leaders of the SGC denomination, along with the T4G leaders continuing strong endorsement of CJ Mahaney, a sincere Christian should rightly question whether supporting this conference is warranted. Another good post you have. Though I basically agree with this I am shocked that of all groups the Gospel Coalition would post this. Isn’t what this article condemns basically what the Gospel Coaltion practices with C.J. Mahaney and others? I wonder if this is another case with this group not seeing their own sin. In my view, Steve, the article you cited is pathetic and meaningless. It doesn’t call out individuals for committing crimes and subtly suggests that the cover up of abuse in the Evangelical community is something that its leaders are just now becoming aware of. That, of course, is an egregious lie if one cares to look at facts. These Gospel Coalition “celebrity guys” have no qualms about condemning, by name, Harvey Weinstein, Bill Clinton,and any number of individuals at Penn State for alleged sexual misconduct. So why won’t they call out their own friends and business partners for abusing people? Because they’re cowards and hypocrites. These Pastors will address sexual abuse, as long as doing so doesn’t cause them to lose money or status in their corrupt little world. End of story, in my opinion. Great article! Please keep the pressure on. I hope this article gets sent to the ten big somebodies who are less than nobodies since they keep on protecting CJ.